Cape May, our base throughout the tour, is one of the world’s best-known migration hotspots and is especially famous for its passerine and raptor passage in autumn. Several top birding localities are within a ten-minute drive of our motel so, on most days, our time in the field will be maximised. On some days, however, we will travel further afield, to Brigantine NWR, Stone Harbor Point and other sites. Day 1 Scheduled flight from London to Philadelphia followed by a one-hour-forty-minute drive to our accommodation at Cape May. En route we should see common species such as Turkey Vulture, Red-tailed Hawk, American Robin, Northern Mockingbird and Common Grackle. Seven nights in Cape May. Days 2–7 Although no two days will be alike, most will produce something exciting. In the mornings we will usually head for Higbee Beach Wildlife Management Area, generally the best place on the peninsula to observe warblers and other passerines. On a good day it is possible to see twenty warbler species plus both kinglets and numerous vireos, all before breakfast! Even on a quiet day, fifteen warbler species is not unusual. 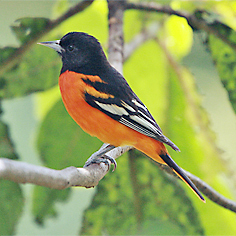 Rarer species, such as Connecticut, Hooded and Cape May Warblers, can be found with a little luck and seeing a fall of several hundred American Redstarts or thousands of Yellow-rumped Warblers can be awe inspiring. Many warblers will be in first-year or winter plumage, although some will retain their resplendent breeding colours. Considerable improvements in identification techniques and much better field guides have revealed autumn warblers to be less confusing than previously thought and identifying them will be a big part of the fun of this trip! In addition, there will be a good chance of seeing Scarlet Tanager, Black-billed and Yellow-billed Cuckoos, Baltimore Oriole, Rose-breasted and Blue Grosbeaks, Indigo Bunting, Bobolink and Dickcissel. By mid-morning the pulse of migration will be winding down and we will have a chance for brunch or a coffee break to boost our reserves for the rest of the day. Various other sites, including Cape May Point, Belleplain State Forest, Stone Harbor Point, the Hawk Watch and South Cape May Meadows, offer rich, diverse habitats. By visiting them all and by gleaning information from the excellent local grapevine we will add many more species to our lists. These should include American Bittern, Clapper and Virginia Rails, Sora, American Woodcock, Cedar Waxwing, Ruby-throated Hummingbird, Belted Kingfisher, Blue Jay, Blue-grey Gnatcatcher, Tufted Titmouse, Chimney Swift, Carolina Wren, Red-breasted Nuthatch, Grey Catbird, Brown Thrasher, Carolina Chickadee and Common Nighthawk. We should also see an abundance of sparrows and Clay-coloured and Lark Sparrows will be worth looking for amongst the many Chipping and Field Sparrows. Horned Larks and American Pipits will be unobtrusive but certainly present and there may be a chance of Lapland Longspur. Identification challenges, such as those posed by the Empidonax flycatchers, will keep us busy: Least Flycatcher is likely and Acadian, Yellow-bellied, Willow and Alder Flycatchers are all possible but can cause headaches! Eastern Kingbird, Great Crested Flycatcher and Eastern Wood-pewee will pose no such problems. Woodpeckers will also feature high on our target list and, by visiting various sites we should see Northern Flicker, which can pour through in hundreds in late September, Downy, Hairy and Red-bellied Woodpeckers and migrating Yellow-bellied Sapsuckers. Red-headed Woodpecker is rather scarce but still possible. Skulking thrushes may need some work but eventually Swainson’s, Grey-cheeked, Hermit and Wood Thrushes plus Veery may be found. Identifying Bicknell’s Thrush will pose a tricky challenge: some say that it cannot be done in the field whilst others are quite happy that it can! Turkey Vulture, Sharp-shinned, Cooper’s, Broad-winged, Red-tailed and Red-shouldered Hawks, American Kestrel and Bald Eagle will be amongst the more common raptors. The migration of Merlins and Peregrine Falcons will be almost at its peak and many of the Peregrine Falcons will be of the ‘tundra’ form originating from the Arctic. We should have no trouble in finding Northern Harrier, which will be everywhere in open areas on the peninsula. At least one day will be devoted to Brigantine National Wildlife Refuge, about ninety minutes from Cape May. This superb refuge is best known for passage and wintering wildfowl and shorebirds. The eight-mile drive loop will give us plenty of opportunity to find many new species including Pied-billed Grebe, Great Blue, Little Blue, Tricolored and Green Herons, Wood Duck, American Black Duck, Blue-winged and Green-winged Teal, American Wigeon, Semipalmated Plover, Least, Pectoral, Semipalmated, Stilt, Spotted and Western Sandpipers, Killdeer, American Oystercatcher, both races of Willet, Long-billed and Short-billed Dowitchers and Greater and Lesser Yellowlegs. Scarcer species such as Red-necked and Wilson’s Phalaropes, American Avocet, Baird’s, White-rumped, Upland and Buff-breasted Sandpipers and Hudsonian Godwit are all possible in the area at this time of year. Terns, including Forster’s and Caspian Terns, should still be present together with a few Black Skimmers. Passerines may include Tree Swallow, Fish Crow, Marsh Wren and Savannah, Song, Seaside and Saltmarsh Sparrows, with a good possibility of Nelson’s Sparrow on migration. Although it is a little early, the vanguard of Canada, Cackling and Snow Geese may well be reaching Brigantine at this time. The first major wave of Snow Geese could harbour the smaller, and much rarer, Ross’s Goose, now being detected annually in the region. Depending on the intensity of the migration, on another day we may take the Lewes ferry across Delaware Bay, primarily to visit the excellent Bombay Hook National Wildlife Refuge. Not only will we find more waterfowl and shorebirds, but this is a refuge with a big reputation for national rarities and it will almost certainly harbour some new additions to our tour list. Should time allow we may visit some of the numerous state parks and beaches around the Delaware shore. Day 8 Sadly, we will have to bid farewell to Cape May but there should be enough time for a final morning at Higbee Beach or perhaps another visit to Brigantine on the way to Philadelphia for our overnight flight back to the UK, arriving on Day 9. General Information The weather can be highly changeable at this time of year, with some days with quite high temperatures and others with strong winds and perhaps heavy rain. The pace of the tour will be fairly relaxed with only a moderate degree of fitness required. There are no special medical requirements. Visas are required. Biting insects will be reduced to a minimum in most areas by late September; ticks, however, especially Deer Ticks, which can carry Lyme’s disease, can be found in the longer grasses and woodlands. Food is excluded from the tour price but is relatively inexpensive; allow about £25 per day depending on your requirements. Group size Minimum number for tour to go ahead: 8; maximum group size: 9 with 1 leader, 16 with 2 leaders. Price includes scheduled economy return flights from London to Philadelphia, all transport within the USA, accommodation in twin-bedded rooms in a medium-quality motel with full en-suite facilities, entrance fees to National Refuges and State Parks and guiding services throughout. Excluded are food and drink, insurance, visa, gratuities and items of a purely personal nature.